Griswold Hall is located at 1525 Massachusetts Avenue on the Harvard Law School (HLS) campus in Cambridge, Massachusetts. The 2-South Suite and Main Entry project is a 1655 square foot renovation that includes five office spaces, a conference room, a storefront, and a restroom on the second floor of Griswold. 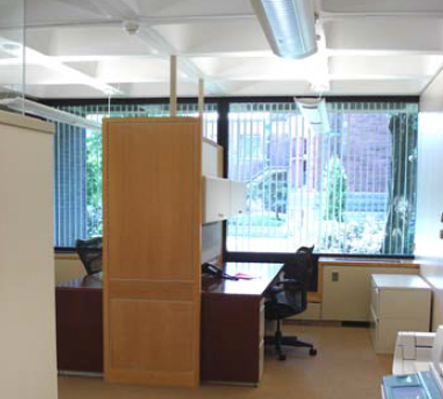 The space accommodates four faculty and two staff assistants in a mix of private offices and workstations and a campus meeting room. Renovations took place in the summer of 2008. Throughout the design and construction process, HLS was committed to the Harvard Green Building Guidelines and to principles of sustainability. The team used an integrated design process to analyze materials and systems that were both sustainable and programmatically appropriate. As of March 2009, this is the first LEED for Commercial Interiors (LEED-CI) Platinum project in New England, first at any University, and only the 19th in the world.